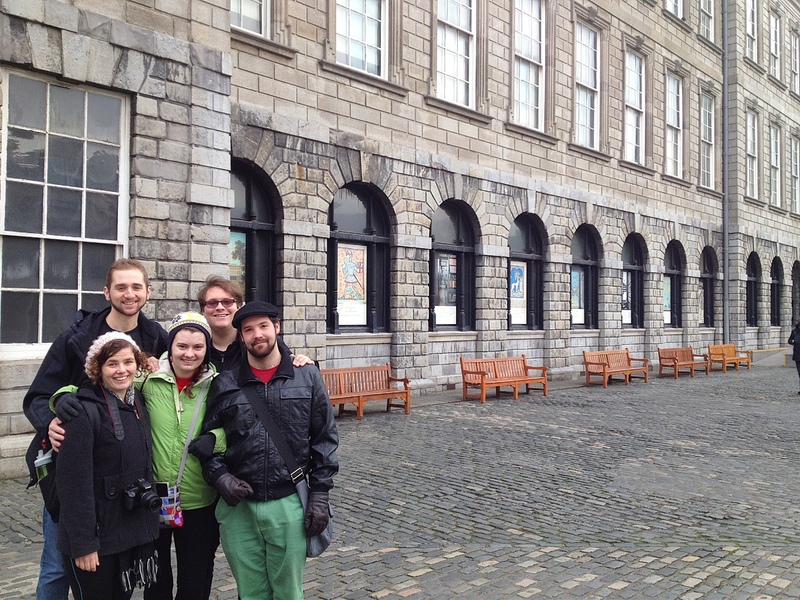 On the banks of the River Liffey, smack dab in the center of Dublin sits Smock Alley Theatre. It is the oldest (newest) theatre in Ireland, having reopened its doors as a theatre for the first time in over 200 years in 2012. 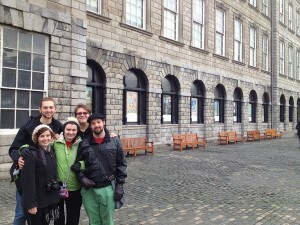 Its walls are older than the United States of America, and it has been home to some of the most important performances in the history of Irish Theatre. The queue wound around the block when the greatest Irish actor of his generation, David Garrick, was to play the title role in the Irish Premiere of Shakespeare’s Hamlet. Tonight, however, the crowd did not quite wind even out the door. When we were at last allowed to enter the theatre through a door behind the bar in the lobby, you could feel the presence of nearly half a century of theatrical history emanating from the walls. A surprisingly small space was presented before us, with three small slanted platforms and three long white sheets representing the sparse set for Mark O’Rowe’s Terminus. Written and performed entirely in verse, the play followed the lives of three individuals out for a night on the town in Dublin. A, a retired schoolteacher frantically searching for a former student whose voice she heard on the suicide hotline that she volunteers at; B, a young woman invited out by her friends whose night takes a turn for the supernatural and morbid; and C, a serial killer who sold his soul to the devil for the ability to sing. The paths of these souls intertwine throughout the night of monologues, nine in total, delivered beautifully by Deborah Wiseman, Fiona Lucia McGarry, and Stephen Murphy. Throughout the ninety-minute performance, the audience was catapulted through all of the feels, ranging from divine to disgust. Our entire group agrees that this has been the highlight of our trip thus far.